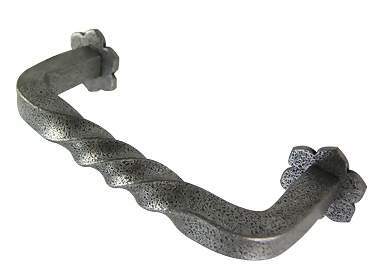 San Carlos Style Iron Drawer Pull (Satin Steel Finish) - available in three mounting sizes including 3 inch (76.2 mm 3.00 c-c), 3 1/2 inch (88.9 mm 3.50 c-c) and 4 inch (101.6 mm 4.00 c-c) center to center. Available in Flat Black, Satin Steel (shown) and Rust finishes. Comes complete with the mounting hardware.